After teaching your child about addition, subtraction, multiplication and division, it is time to teach fractions. The usual way of looking at fractions is as smaller than a whole. For example, if you have one pizza - that is called one whole. 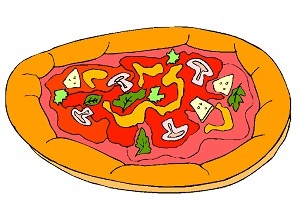 Now you cut the pizza into smaller sections, each section becomes a fraction of the whole pizza. So a fraction is smaller than a whole. The important thing to remember when you cut the whole into smaller sections is each section must be of the same size. Whole numbers are the numbers that we know: 1, 2, 3 and so on. 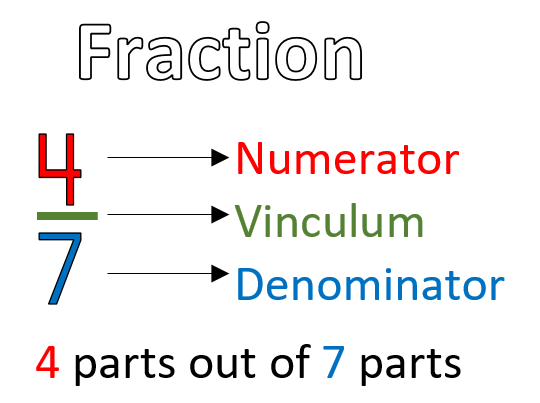 Fractions are numbers that are written in 2 parts: a numerator and a denominator, separated by a line called a vinculum. means we cut the whole into 2 equal parts but we only want 1 part of it. Half is one part out of two. One-third is one part out of three. Three-fifths is three parts out of five. From this concept, we can see that when the numerator and denominator is the same number, it means we want the whole thing. So a whole number can also be written as a fraction. Four out of four means we want all four parts. Six out of six means we want all six parts. 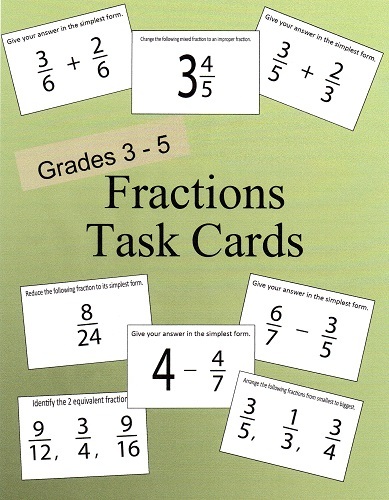 Get Fractions Task cards to practice with your child. 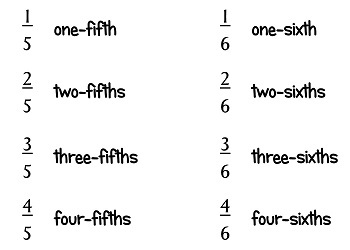 The way to name a fraction is to say the numerator as a number (one, two, three...) and the denominator as a positional number (third, fifth, sixth, seventh...). The exceptions are half where the denominator is two and quarter where the denominator is four. Here is a free resource for you to practice matching fractions with your child. Print and cut out the cards. There are two sets; one set with clues and one set without clues. 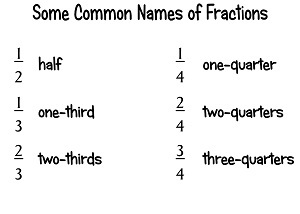 You can match the fraction and its name. 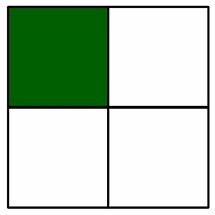 Or match the fraction and the picture. Make it into a game to see who can do it fastest. Or use it as a game of concentration or memory. 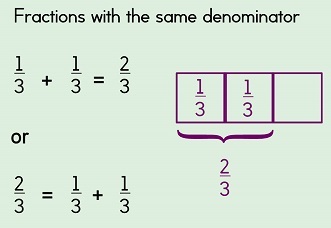 When fractions have the same denominator, they can be combined. The best way to understand this is to use the singular fraction as a frame of reference. For example, if the whole is divided into 3 pieces, we use one-third as a frame of reference. If there are six pieces, we use one-sixth as a frame of reference. If we cut a pizza into 3 pieces and we take one piece, what fraction of the pizza did we take? That's right, the answer is one-third or one piece out of three pieces. 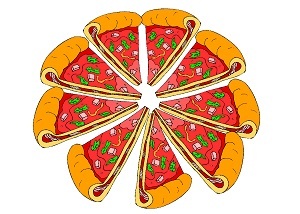 If we take another piece of pizza, what fraction of the pizza did we take altogether? We took two-thirds of the pizza (two pieces out of three pieces). So this means that one-third plus one-third is equal to two-thirds. Or we can say two-thirds is made up of two one-thirds. Here is a simple game to help your child understand this concept. Put five counters, buttons or small objects into a box. Ask your child to take out two-fifths of the objects. The box represents one whole. Remember to use objects that are identical. Take turns with your child to ask for the fraction. This is also good practice in naming fractions. You can also write the fractions on paper so your child gets used to writing and reading fractions. Now do it the other way around: pick out three items out of five and ask your child for the fraction of items picked out. After your child has mastered the concept, you can introduce adding and subtracting fractions of the same denominator. Encourage your child to use the box of items to help him or her figure out the answers. 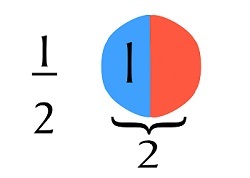 A fraction is also a type of division. Instead of applying fractions to one whole, we can apply fractions to a group of items. For example, half of six toys would mean three toys. Just like in division, we start with the total, then we divide the total into groups or portions. Unlike a fraction of a whole, in this case, the quantity in each group must be equal, not the actual size of whatever we are dividing. the same, the actual quantity may be different. Let's look at the following problem. 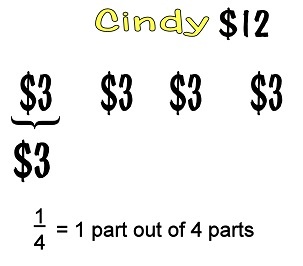 Melody has $4 and Cindy has $12. Melody spent three-quarters of her money while Cindy spent one-quarter of hers. How much did each girl spend? 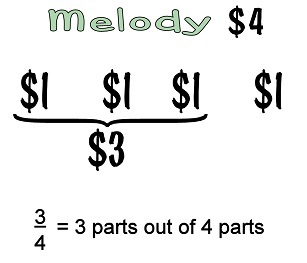 When you look at the fractions alone, three-quarters is bigger than one-quarter so you would think that Melody spent more money than Cindy. But when you work out the exact amount of money each girl spent, you would realise that they both spent $3.